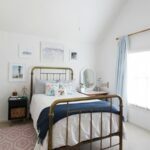 My absolute favorite DIY in the Young Modern Vintage Bedroom Makeover is the leather woven storage ottoman to accompany her reading chair. 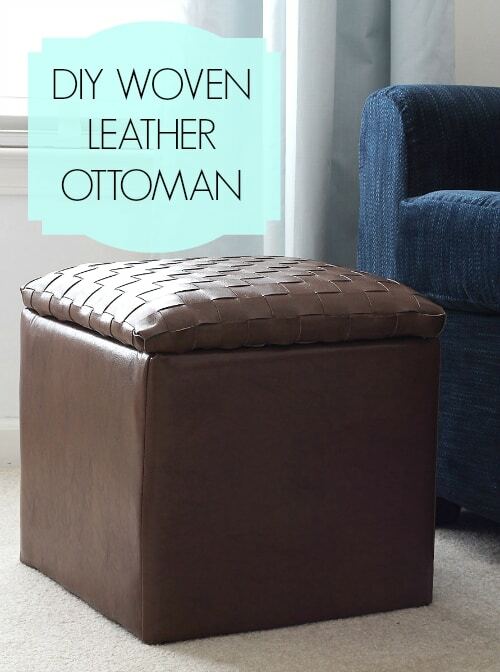 It may seem a little complicated to weave leather for an ottoman, but I promise it is an easy DIY. 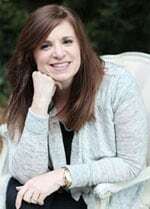 All you have to do is channel your crafty summer-camp-self. 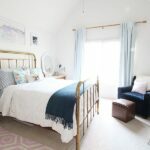 You know those woven creations you proudly came home with after a week of summer bliss? Those cotton potholders or paper baskets? Yup, this is just that easy. 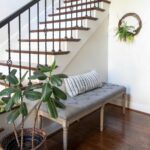 The only difference with this project is you are weaving with “leather” and the results are much, much more sophisticated. 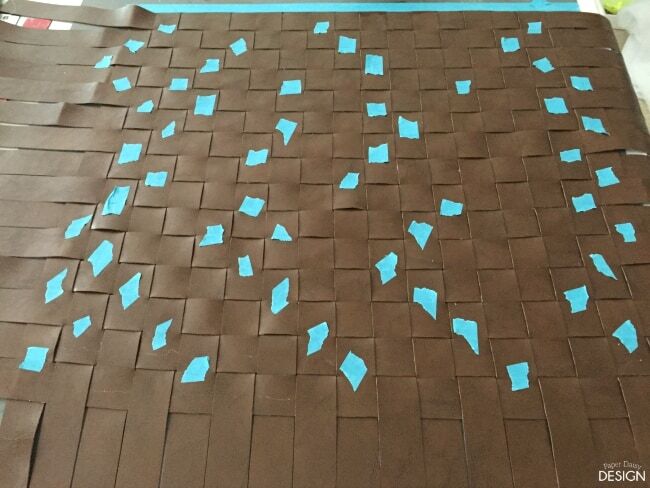 About the “leather”, we were unable to find any real leather locally in the color we desired for this project. But we were very picky about finding a vinyl that looked like the real deal. 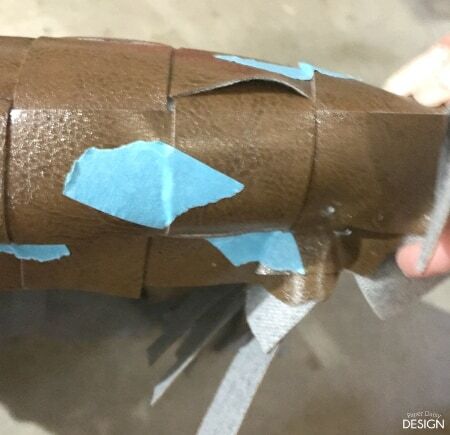 The hand of this “leather” is very soft and does not have a plasticky feeling at all. Sharp scissors, These are my favorite for fabric projects. 1. 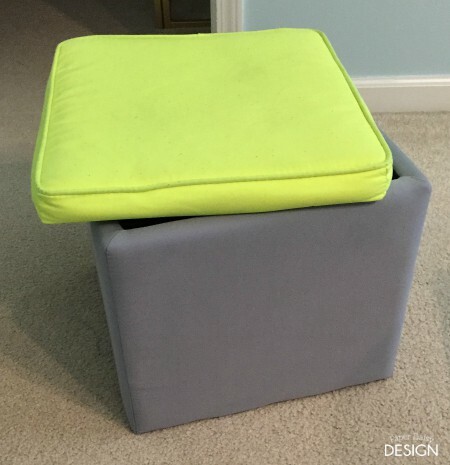 Start with a very basic, very inexpensive, cube storage ottoman. (If I remember correctly, this one was purchased years ago from Target on clearance after back to school ran it’s course, for around $8.) You can see it was well used at this point, but nothing a little extra batting couldn’t fix. 2. To cover the base of the cube. 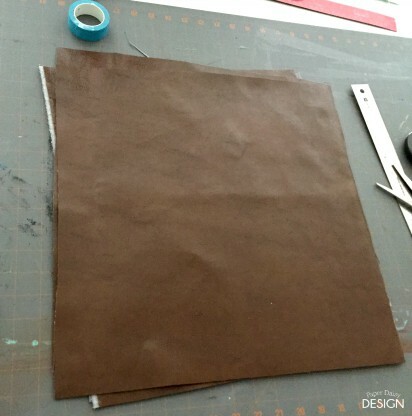 cut 4 pieces of leather about an inch wider and taller than the cube. 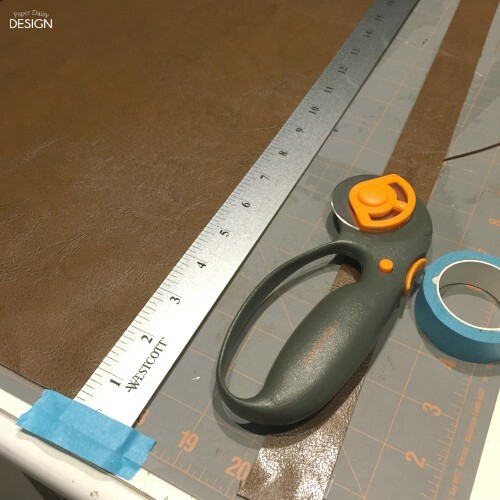 Instead of pinning the pieces together for sewing, use tape to hold the seams together and avoid getting holes in the leather. Then, working around the cube, sew the pieces together to make a square sleeve. 3. Using a staple gun, staple the top and bottom of the sleeve to the cube, folding corners around and down. 4. 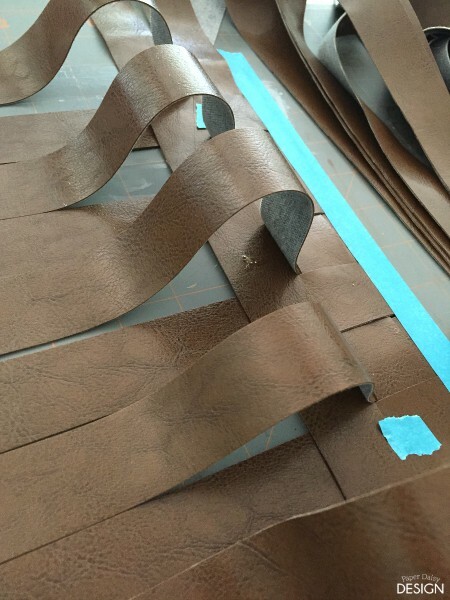 To create the weave, begin by cutting strips of leather about an inch wide. I used the width of my ruler as my cut width which was 1 1/4″. For good measure, the length of the strips should be a good 2 to 3 inches longer than the length and width of your top. Also, don’t forget to add in the depth of the top as well. With a rotary blade, use one hand to firmly hold the metal ruler and the other to cut with the blade. I found it was very helpful to tape the ruler down to my work surface for each cut to keep it from slipping on the leather. 5. 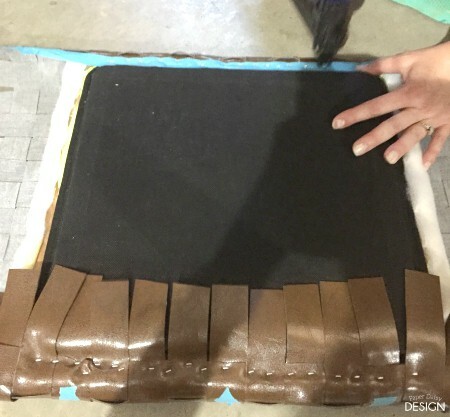 After strips are cut, enough to cover in both directions, line enough of the strips up to cover the ottoman and tape them down with no space in between. 6. 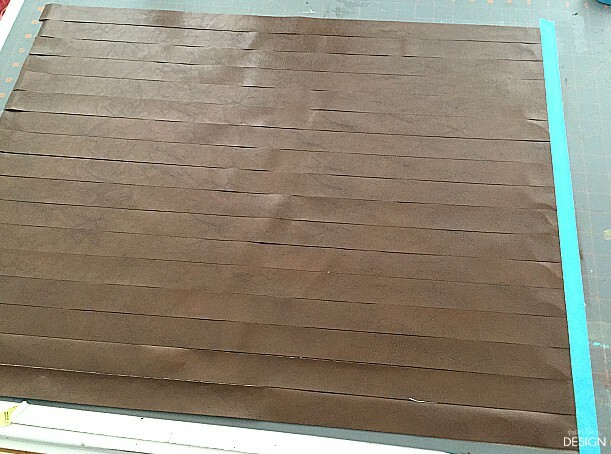 Begin weaving the horizontal strip of leather, under every other vertical strip making sure the top of the strip is snug against the top of the starting piece. I found it helpful to raise the strips I was weaving under up as shown. 7. 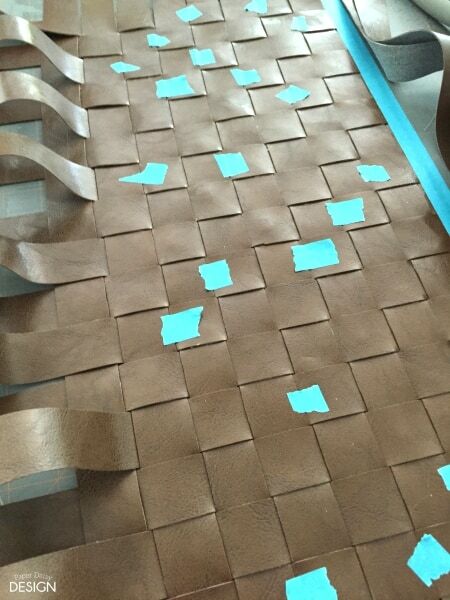 Once each strip is in place, add a dot of fabric glue under every other strip and smooth the strip down. Continue repeating the alternation of over and under creating a weave as shown. 8. 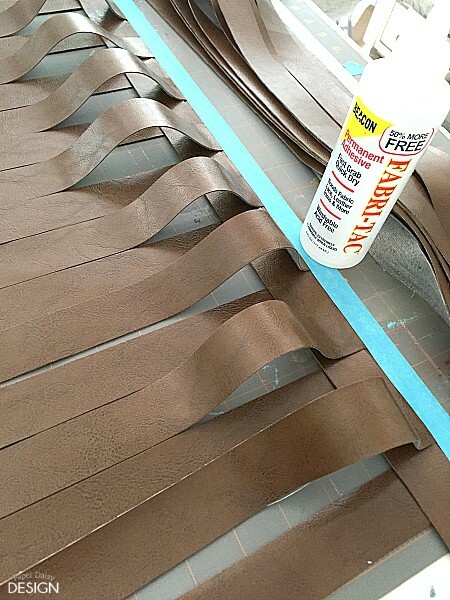 Because the leather is slippery and a tight weave is desired, it is helpful to add alternating small pieces of tape as you move down the weave. 9. 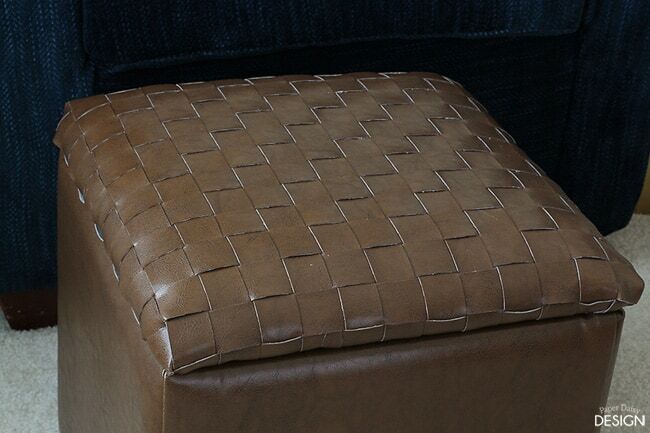 Once the weave is large enough to cover the top of the ottoman, carefully remove the woven fabric from your work surface. 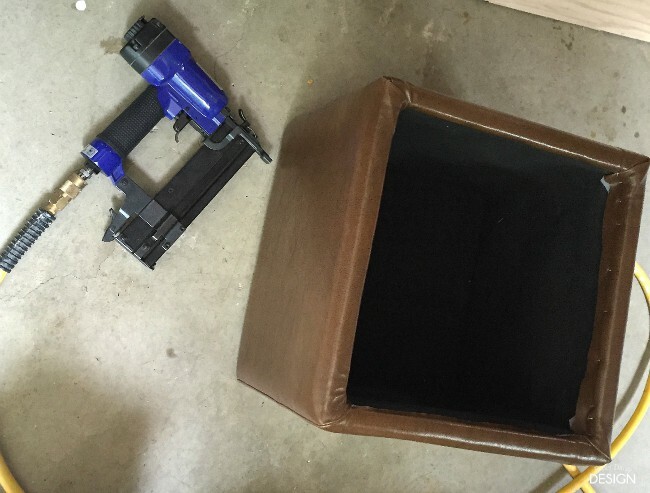 Leave all the tape in place while you upholster the ottoman. 10. 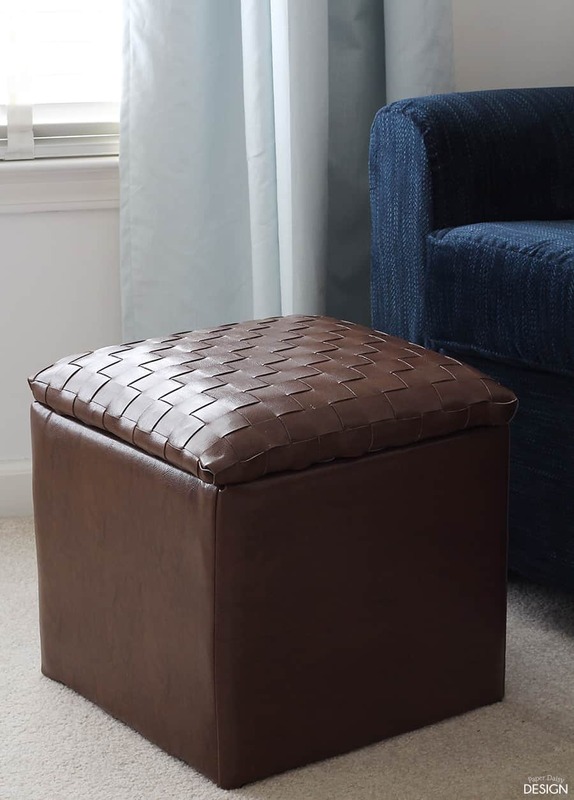 Carefully turn weave upside down and place ottoman lid on top and begin stapling on one side of the square and then the opposite side. 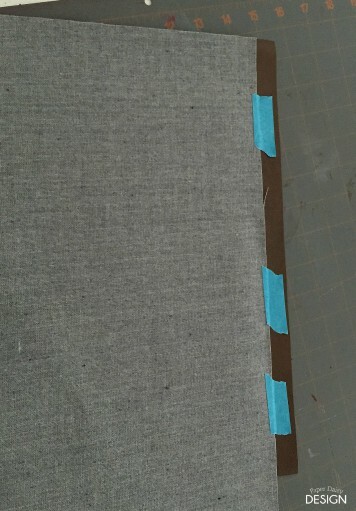 While upholstering with the weave is not much different than any other fabric at this point, special care was given to the corners. It really depends on which portion of the weave ends up on the corner as to how handle the corner. Some corners, the last strip could be wrapped around the corner and tucked into the weave, others easily wrapped over the edge. 11. 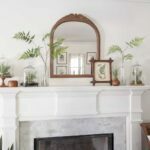 Gently remove tape and marvel at your woven wonder! Get weaving friends! You can do this. I’d love to see your woven masterpieces. I promise I’ll be as proud of you as your parents were of your when you returned with summer camp creations! Now that is fancy-looking! 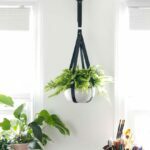 I’d have never guessed this was a DIY project. 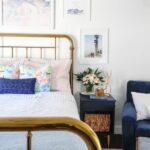 I love ottoman’s because they hid trinkets and magazines so well to make a room look polished. Great job on this! i wish i could do it like that – i wish i could…. 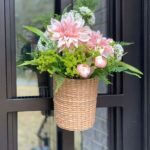 This is awesome I’m starting to like all DIY…will look around your page for more. Thanks for sharing. Really cool! I was thinking about featuring this on my blog tomorrow. What a great idea! 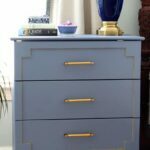 Love DIY projects. This is amazing! Thank you for taking the time to make it easy for us to do. I’m a fan of all things leather. 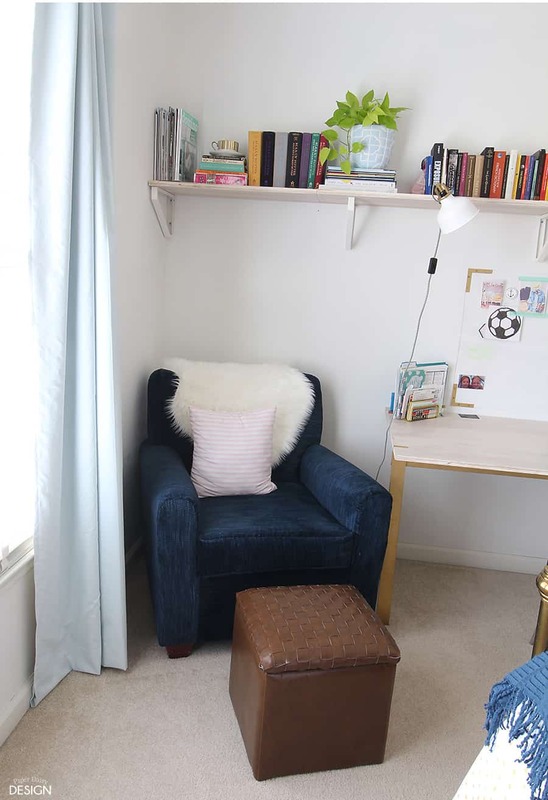 This looks relatively simple for as elegant final product as you made! Not sure I’ll tackle this soon, but maybe next room redo. What an excellent job you did. It looks like a professional did it. I am not brave enough to try such a project. Seriously, if you can weave paper you can do this. The upholstery on this piece is super simple too! Just wrap it over the edges and staple! I can’t believe you MADE that! SO impressive!